Contests have always been interesting and people overwhelmingly participate in them and grab prizes. Winners can take home the prizes happily. Now that everything has moved online, conducting of contests online is not an exception. Many contest websites are present and many more are in the pipeline. Among the wide variety of contests, writing contests are very famous. While the contest holder lists the contest, with all the rules on the site, the participant can take part and can submit his writing work. If won, the participant can grab the prize amount. Holding such contests helps the contest holder to get an exposure to their business, brand or product. So what it is to the owner of the text contest or writing contest website? On every payment made by the contest holder to the winner, some percentage of money goes to the website owner. Many budding entrepreneurs have been showing interest in implementing a text contest software. However, not many know how to launch such a website. 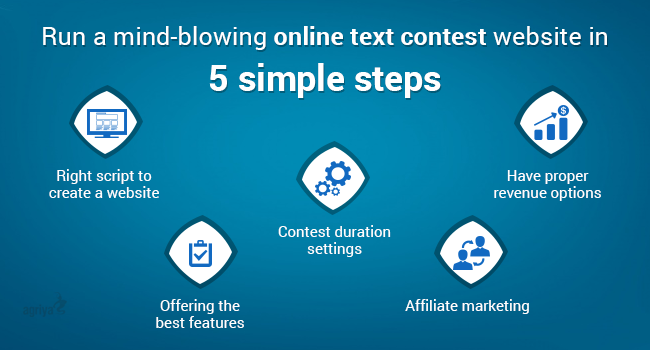 5 simple steps may help you kickstart a text contest website. For any website to be launched, an excellent script is needed. The script can create and launch an impeccable website. Similarly, for launching a text contest website, you need a cutting-edge text contest script. It should be highly advanced, should have a great user interface, easy navigation. Importantly, it should be easily customizable. Ignoring the features part can prove to be a disaster. With the advancements in technology occurring frequently, it is important your website is modern. Features like highlighted contest, private contest, featured contest, participant management, social network connectivity, etc should be present. Some contests may get an overwhelming response while others may falter. In such cases, contests listed by contest holders should be extended by time. Your website should have the option to allow contest holders to change the duration of the contest. The option of reducing the duration of the contest will also be helpful. Unlike most other commercial sites, the contest sites can have numerous revenue options. A fee can be set on diverse factors. Membership fee can be charged, however, it is optional. Apart from that, contest duration fee, blind contest fee, featured contest fee, private contest fee, highlighted contest fee can be charged from the contest holders. From the winning participants, a certain percentage can be charged as website commission. Affiliate marketing helps you get huge traffic to your text contest website. More traffic translates to more number of contest holders and participants. As a result, you can witness a rapid growth in your website's revenue. The affiliate websites that drive traffic to your website will get a certain percentage as commission. Following some simple steps before to launching an online text contest website will make a huge difference, giving the site a great success. Proper planning is certainly important as your success depends on the quality of site you offer the users.